Published September 2004,May 2009,February 2011. A "representation", at its simplest level, is defined in the Oxford Dictionary as "a thing that represents another". Springing from a course I attended where we looked at mathematical representation, here I look at an example discussed during the course and consider the difficulties I had in understanding it. Finally, I will look at children's use of representations in the reception classroom, both spontaneous and teacher suggested. I am comfortable with plotting graphs and enjoy thinking through how I might represent information graphically. 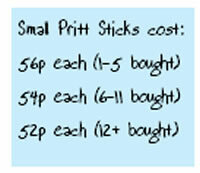 The first example relates to buying Pritt sticks, where the price for each stick gradually reduces as you purchase larger quantities. When plotting the graph I had to ask myself questions such as, "Do I need to join the points I have plotted for the number of Pritt Sticks I can buy against the cost?" "What do joined points represent?" "Does this have any meaning in this case since I am unable to buy half a Pritt Stick?" etc. (see table 1 and figure 1). The graph of number bought (x-axis) against cost (y-axis) would therefore look something like figure 1. On the course I was also introduced to step functions for the first time (as far as I can remember, anyway!). These proved to be a very useful and logical way to represent cases where, for example, the number of footballs that can be bought at £6.50 is plotted against how much is available to spend (up to £100). This form of representation allowed for the fact that whether you had £19.50 or £25.99, you could still only buy 3 footballs but as soon as you had £26.00, you were able to purchase 4 footballs. The open dot represents the point at which the step to the next amount is made (see figure 2). This representation proved very powerful at representing several sets of data e.g. how many buns I can buy with a given amount of money, or the cost of sending different weights of packages by first and second-class mail. I also enjoyed attempting to sketch graphs from pictures. For example, being given a racing circuit and plotting the speed of the car against its distance along the track (see figure 3). I found the task of sketching the graph from the circuit fairly straightforward, although it was more of a challenge to sketch the circuit from the "speed versus distance along the track" graph! (See figure 4.) I had to consciously remind myself of what the axes represented and not dwell on what the pictorial drawing could represent; for example, the bends in the graphs did not necessarily represent bends in the track! It was the reading of the graph that I found challenging. A study by Janvier in 1981 illustrates children having very similar difficulties . Only 46% of 12 - 13-year-olds, when asked how many bends there were on the circuit (looking at a similar graph to that in figure 4), gave the answer of three, and only 68% of 14 - 15-year-olds gave the correct answer. At least I was not alone! Another example of moving from a real experience to a graphical representation is given by constructing a graph to show the height-volume relationship for beakers as they are steadily filled with liquid. For example, if container A is steadily filled with water, the height-volume relationship is represented by the graph in figure 5. I found it relatively straightforward to relate the two images. I could understand the relationship between the fact that the container had straight sides and how that would lead to the height of the water increasing at a constant rate compared to the volume of water that had been added i.e. the graph required a constant positive gradient. However, my understanding was challenged when I moved from a more complex height-volume graph to a sketch of the container. The height/volume graph is shown in figure 6. I initially concluded that the container would have the form shown in figure 7, since the rate at which the height was increasing initially with volume was increasing ie, the container got narrower, and then it decreased ie, the container must now get wider. Then, finally, the gradient began to increase again ie, the container got narrower again. However, when we discussed this, two alternative suggestions were made, shown in figure 8. Thus, in this case, figure 6 is an external representation and figures 7 and 8 are internal representations. Our three internal representations had all come from only one external representation. This clearly demonstrated what Janvier, Girardon and Morand  describe as "homonymy" where one external representation (in this case figure 6) can create more than one internal representation (figures 7 and 8). As a teacher, I need to be aware that although children may only be presented with one external representation, a wide variety of internal representations may well occur as the children interpret the representations in a variety of ways. I need to allow the children plenty of opportunity to share their interpretations to ensure they are interpreting the representation in the way I had planned. 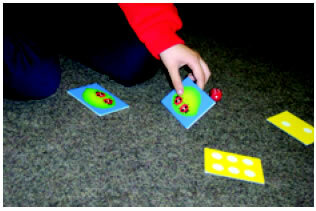 I regularly play a game with groups of children in my class called "The Game of Ladybirds". It is a simple dice game that involves placing a set of cards face down on the table. Each card has a pattern of dots on the top, corresponding to those on the faces of dice. The players take it in turns to throw a dice and then turn over a card with the matching pattern on it. On the reverse of each card are between zero and three ladybirds and the player keeps this card. Players continue to take it in turns to throw the dice and select a card, until all the cards in the middle have been taken. The winner is the player with the most ladybirds at the end of the game. 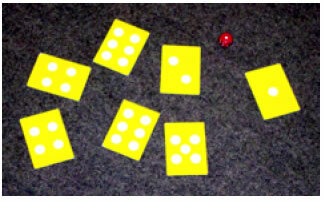 It is a game that teaches the children to recognise the number of spots on each side of a dice but also helps them to count objects accurately when they count up their total at the end of the game. However, I decided to use this game with several groups of children to look at their ability to represent information, and also to introduce block graphs as a representation to the children for the first time. We began by playing the game as normal. When we got to the final stage of totalling up how many ladybirds we each had, I asked them to count their own but keep the total a secret. I then gave them each a piece of paper and a pencil and asked them, on their own, to "put something on the paper that would show me how many ladybirds you have got altogether" . (I chose this phrase carefully so as not to make any suggestions about whether I was expecting them to draw or write on their paper.) The children chose to use a range of representations, for example, Dana had three cards that contained three, two and zero ladybirds. Her representations were iconic (where an action or object is replaced by an image) since she chose to represent her collection by drawing the five ladybirds as in figure 9. Thomas also chose an iconic representation. However, his differed from Dana's in that he drew a large ladybird to represent his collection of three ladybirds, but since he knew that each of the original ladybirds had two spots, his new large ladybird had six spots, see figure 10. I understood how Thomas must have felt since I had had a similar experience myself in the college group when I had tried to represent a large cube model; we were both learning the lesson that what might appear clear to us, is not necessarily clear to others. Thomas' interpretation also made me wonder if the instruction I had given to him had misled him; I had asked him to, "put something on the paper that would show me how many ladybirds you have got altogether". It seemed that he had heard something more along the lines of, "put all the ladybirds together on your paper" which would explain why he had chosen to combine his three ladybirds into one large one! In my attempt to not give too much instruction for what I wanted Thomas to do, on reflection, I may not have been clear enough. Another child in the group, Austin, had collected five cards, containing eight ladybirds in total. He chose to represent his collection more symbolically, using small blobs to represent each ladybird, as shown in figure 11. Elizabeth chose to represent her collection of thirteen ladybirds purely symbolically, although the numerals were reversed, as shown in figure 12. Once each child had represented their collection of ladybirds themselves, I suggested that we put all the information together so we could see it all on one piece of paper. I wrote the names of the children in the group in a column and created a simple table. I asked the children how I could show how many ladybirds each of them had got on my table. Bailey suggested drawing the right number of ladybirds next to each name. I asked Austin to remind us of how he had chosen to represent his ladybirds and then, building on Austin's idea, I suggested to the group that we used an oval shape to represent each of the ladybirds. This group's results are shown in table 2. We discussed the information on this graph for a while and I asked the children questions such as, "Who had the most ladybirds? " and, "Who had five ladybirds? " This helped the children to use the representation and begin to interpret the information. I found that the children coped well with the graph and were able to answer the questions I posed. I also allowed them to all keep their original cards visible, which maintained the link between the symbolic (using a code or symbols to represent the object), the iconic (the object being replaced by an image) and the enactive (where something is learnt by hands-on experience) modes for them. Since this small introduction to block graphs was successful, I plan to follow it up with some work on block graphs using a computer package that produces simple graphs. It will be interesting to see if the children are able to make the same connections when presented with the information in a new format or whether they will face new problems. This article was written by Sarah Holmes, a reception teacher at Davyhulme Infant & Nursery School, Manchester and was first published in Mathematics Teaching 186, a journal produced by the Association of Teachers of Mathematics. The article can also be found on the ATM website . We would like to thank Sarah and the ATM for allowing us to reproduce it here.